A woodpecker pounding on the side of your house or on a metal vent cap at 5 AM, or any other time, can be quite annoying and also result in some expensive repairs to the wood siding on your house. The suggestions in this article will try to help you solve your woodpecker problem. Before you resort to violence however, remember that there is no open season on woodpeckers. There are 21 species of woodpeckers in the United States. These handsome birds reward us by consuming millions of noxious insects, including carpenter ants and carpenter bees. Woodpeckers hammer or peck on wood or metal for basically three distinct reasons. The first has to do with foraging: wood is a major source of insects that woodpeckers seek for food. Woodpeckers will actively search for insects by pecking, chipping, or flaking the wood. The damage from this feeding activity usually occurs in horizontal lines that follow tunnels made by the insects. The second reason for hammering is called drumming whereby the male announces his claim to a territory and attracts mates by tapping in rapid succession on resonating wood or metal. This is usually done before or during the breeding season, usually February through July, and serves a similar function as singing in songbirds. Drumming is loud, but it is typically short-lived and shouldn’t be considered an endless or destructive problem. The third form of hammering is destructive, and the word “nuisance” fits into the equation. It is called excavating (or chiseling) whereby either males or females construct holes to store acorns, or to make a nest or roost hole with a chamber, typically in trees. This is the most common cause of damage. The chamber is used for sleeping or rearing the young. Unfortunately, some woodpeckers try to place such a cavity in the side of a house, barn, utility pole, fence post, or other man-made structure. Damage to wooden buildings may take one of several forms. Holes may be drilled into wood siding, eaves, window frames, and trim boards. 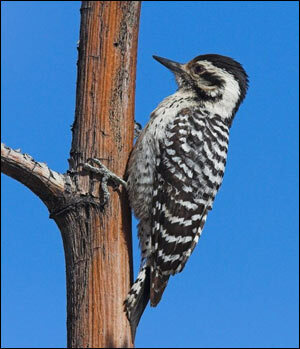 Woodpeckers prefer cedar and redwood siding, but will damage pine, fir, cypress, and others. Natural or stained wood surfaces are preferred over painted wood, and newer houses are often primary targets. Particularly vulnerable to damage are rustic-appearing, channeled plywoods with cedar or redwood veneers. The channeling provides places for insects to harbor, thus attracting the woodpeckers. Sapsuckers bore a series of rows in the bark of limbs or trunks of trees and use their tongues to remove the bug-laden sap. At times, limb and trunk girdling may kill the tree. The wounds of attacked trees can also attract insects, diseases and wood decaying organisms. Woodpecker damage can be prevented or eliminated with several techniques including visual scare devices, loud noises, exclusion, providing a nest box or drumming site and, least preferably, killing. Take immediate action to reduce damage because woodpeckers are not easily driven from their territories or pecking sites once they are established. Scaring woodpeckers at the first sign of activity can deter the pests. You can try hanging strips of foil, plastic, or fabric from under the eaves. Balloons, hawk silhouette mobiles and mirrors may also be effective at scaring the woodpeckers. Because of the woodpecker’s persistence, they are not easily driven from their territories. There is a new product which has proven results: the Birds-Away Attack Spider. Activated by sound, the spider quickly drops down on a string while making a loud noise, which scares away even the most determined woodpecker. If scare tactics don’t work, create a physical barrier by screening the drumming site with hardware cloth, sheet metal, or nylon bird netting. It might work to provide a man-made nest box directly at the site that is being damaged. The woodpecker will use the box instead of having to make a nest hole. An alternative drumming site can also lure woodpeckers away from your house. Nail two boards together at just one end and hang it on a secure surface. Please don’t get your shotgun and start blasting away. 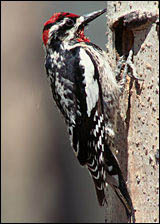 Woodpeckers are protected by the Federal migratory Bird Treaty Act as migratory, nongame birds. If you can’t get rid of them yourself, you can always try calling a professional pest control company experienced with woodpecker control. ABSTRACT Woodpeckers cause severe damage to utility poles and crossarms, resulting in substantial economic losses to utility companies. We evaluated effectiveness of a polyurea elastomer coating material for reducing damage by captive pileated woodpeckers (Dryocopus pileatus) to utility pole crossarms. Because woodpeckers inflicted essentially no damage to the fully coated crossarms, we infer that the coating material holds substantial promise for protecting utility pole crossarms. Additional research should be conducted to evaluate the coating under field conditions.